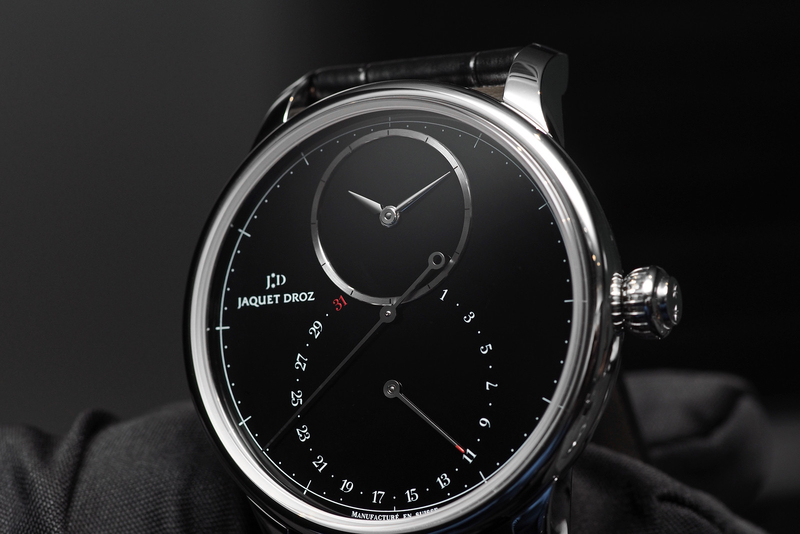 Last month at Baselworld, Jaquet Droz debuted a timepiece, with a deadbeat seconds function, and a unique dial made from black onyx called the Grande Seconde Deadbeat Onyx. For each Grande Second Deadbeat Onyx dial, a piece of onyx is cut and then polished to a glossy finish, resulting in a look that is quite striking, especially when contrasted by the 18K white gold monoblock applied chapter ring. 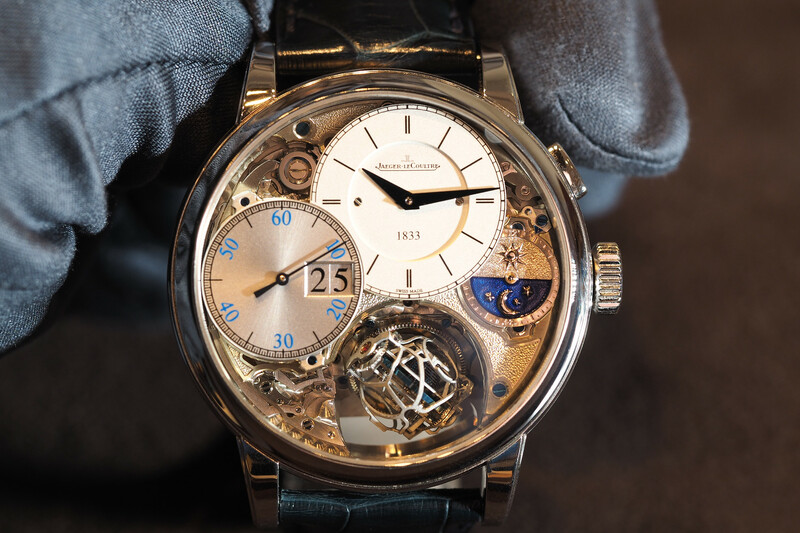 The hours and minutes are indicated by polished white gold Lance-shaped hands in the upper dial. And a long centrally-mounted baton-shaped hand, with an open-tipped counterweight, indicates “deadbeat” small seconds (instead of smoothly sweeping hand like the majority of mechanical watches, the second hand ticks like a quartz movement). There is also a retrograde date display by hand at 6 o’clock. The case is 43 mm x 13.79 mm, crafted from stainless steel, and like the rest of the watch, has a reflective, fully polished surface. But even with so much sheen, the minimalist dial, and constrained design, result in a watch that is flashy without being gaudy. Animating the timepiece, and visible through a clear caseback, is an automatic caliber 2695SMR, which has a silicon balance spring and pallet horns, deadbeat seconds, and is decorated with Côtes de Genève rayonnante (sunray Geneva stripes), perlage, and a matte frosted skeletonized rotor with an embossed Jaquet Droz logo. 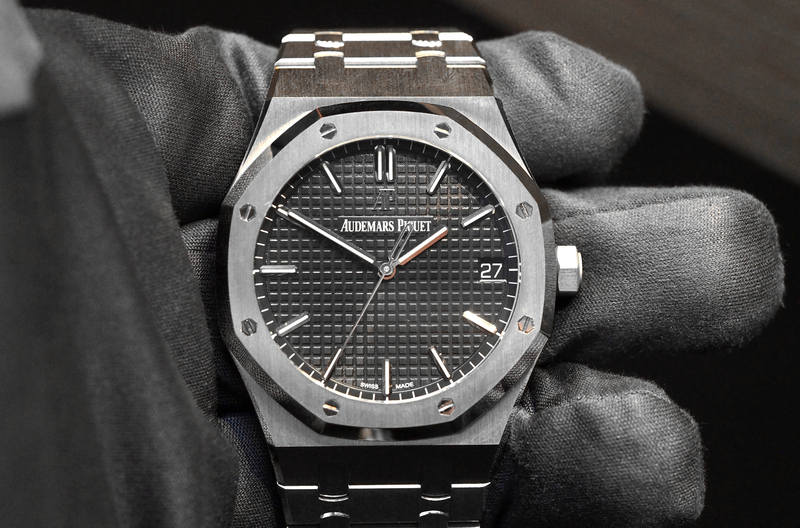 The power reserve is 38-hours.